However, it also indicated that the weak pound had pushed up firms' costs. A weakening of the pound makes UK goods cheaper for overseas buyers, but increases the cost of goods imported into the UK. Since the Brexit vote, the pound has fallen in value by more than 10% against both the US dollar and the euro. Following the release of the latest PMI survey, the pound jumped by 1%, more than a cent, against the dollar, to $1.33 before falling back slightly. Against the euro, the pound was 0.6% higher at just under €1.19. Markit said the month-on-month increase in the PMI level was the joint largest in the survey's 25-year history. 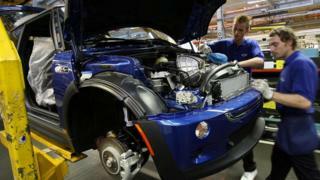 "The August PMI data indicate a solid rebound in the performance of the UK manufacturing sector from the steep downturn that followed the EU referendum," said Rob Dobson, senior economist at IHS Markit. "The domestic market showed a marked recovery, especially for consumer products, while the recent depreciation of sterling drove higher inflows of new business from the US, Europe, Scandinavia, Middle East and Asia," he added. Mr Dobson also said that inflation was "raising its ugly head". "Rates of increase in input prices and output charges both hit five-year highs, which manufacturers placed squarely at the door of the cost impact of sterling on import prices," he said. The latest PMI survey chimes with last week's CBI survey, which showed that export orders were rising at their fastest rate in two years. At the time, the July PMI figure was taken as immediate evidence of an impending downturn, following June's referendum vote in favour of the UK leaving the EU. It was one of the pieces of evidence that contributed to the Bank of England's recent decision to cut its interest rate to 0.25%. But Laith Khalaf, from the investment firm Hargreaves Lansdown, said the latest PMI figures now called the Bank's decision into question. "It certainly seems that companies and consumers alike are carrying on with business as usual now the referendum is disappearing into the rear view mirror," he said. "There's still a long way to go until Britain leaves the EU, and in the meantime, businesses still need to make money, so they can't just sit on their hands. "However, the gathering pile of robust economic data might start to dissuade policymakers from any further monetary easing," he added. Next week, another PMI survey, of the much larger services sector, will provide another snapshot of the state of the UK economy.